The Trump administration on April 10 called on the United Nations to revoke the U.N. credentials of illegitimate dictator Nicolás Maduro’s socialist regime and to instead recognize the internationally recognized interim president, Juan Guaidó. Vice President Mike Pence, as part of the administration’s latest effort to pressure the embattled dictator to step down, said that the United States has drafted a U.N. resolution and called on all states to support it. 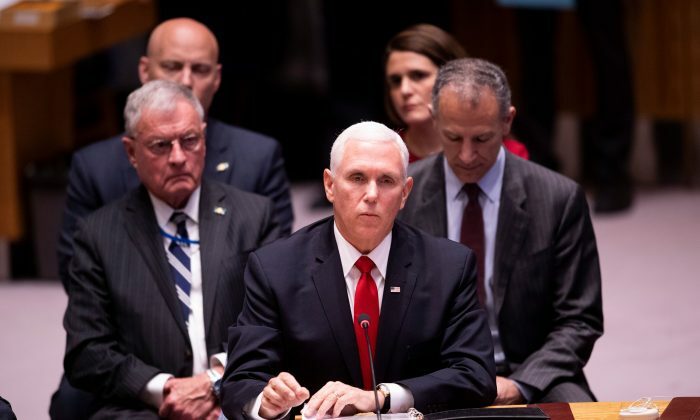 “The time has come for the United Nations to recognize interim President Juan Guaidó as the legitimate president of Venezuela and seat his representative in this body,” Pence told the U.N. Security Council. In February, both the United States and Russia failed in rival bids to get the Security Council to adopt resolutions on Venezuela. The United States was the first country to recognize Guaidó as Venezuela’s rightful leader. Guaidó also has the support of more than 50 nations internationally. Russia and China have, for years, fed billions of dollars to Maduro’s regime through loans and energy deals. The United States had called the meeting to discuss the humanitarian situation. U.N. aid chief Mark Lowcock told the council that there is a “very real humanitarian problem” in Venezuela. He briefed the council on a recent U.N. report on the situation that estimates that about a quarter of Venezuelans are in need of humanitarian assistance, painting a dire picture of millions of people lacking food and basic services. Some 3.4 million Venezuelans have left the country, with the United Nations predicting that number will rise to some 5 million by the end of the year. Days ago, the U.S. Treasury Department announced new sanctions on 34 vessels owned or operated by Venezuelan state-run oil company PDVSA that carry oil to customers outside the region. It also sanctioned two shipping operators and a vessel that delivered oil to Cuba in February and March. The department reiterated that the United States continues to push for a transition to democracy in Venezuela.